I’ve learned a lot in the process of editing (and totally rewriting chunks of) my first completed manuscript, REMNANT OF US. Much of what I’ve learned, I should have already known: use of cliffhangers; proper pacing of plot, individual scenes, and character development; generally accepted manuscript formats; and the landscape of self and indie publishing versus traditional publishing. Back while I was on draft six, I sent out a handful of queries (less than ten), and received only form rejections. Months later, I sent out more queries while on draft ten or so, and I got some requests for a partial/full but, ultimately, no offers of representation. Having finished draft thirteen, I’m waiting on two more beta readers to get back to me before I hammer out draft fourteen and fifteen. Draft fourteen will likely include some major changes to clarify certain things and even out the pacing between the two protagonists’ story arcs (coincidentally, my female beta readers prefer the male protagonist’s story, whereas my male readers prefer the female protagonist’s more action-oriented chapters). I might include a map as some readers have suggested. Draft fifteen will, hopefully, be a simple round of copy editing before I send out more queries. Notably, I’m getting more comfortable with self-marketing, making the indie route a bit less daunting and, potentially, more profitable. It’s so tempting. My second project is about one of the original fallen angels trying to get back into God’s graces, and I’ve made some progress. I’ve finished a rough first chapter, and fleshed out much more of the setting. Actually, I had another first chapter but totally scrapped it in favor of this new one which I believe is much more compelling, starting and ending with what I hope are darned good hooks. As research and for entertainment, I’ve been watching CW’s Supernatural on Netflix as it seems to overlap in genre and setting with DEMON, HUNTED. Primarily, I wanted to see what’s already been done in the genre beyond my knowledge of Joss Whedon’s Buffy-verse, the Twilight movies, and the Keanu Reeves Constantine film. I should probably also read actual books in the genre, but that probably won’t happen anytime soon. Of course, I did read Paradise Lost in college, which is where my idea for this novel originated (“Why can’t demons seek forgiveness?”). My goal is to have enough originality so my novel doesn’t bog down my readers with deja vu and, more importantly, to write something entertaining. I’ve been wanting to start a superhero project for a long while, but I haven’t started writing the outline for the project until recently. Like Watchmen, this story will take place in the United States with an alternate history which includes the presence of super-powered beings and superheroes. Unlike Watchmen, costumed superheroes aren’t outlawed but, like Marvel’s Civil War, the United States heavily regulates and watches over the activities of those with powers. In my planned novel, a majority of the more powerful “superheroes” work in private security, resulting in a setting where most of the population sees little to no super-powered help. I don’t know what other superhero fiction has had a similar setting, but I’m willing to bet it’s already been done somewhere (off the top of my head, Metal Gear Solid 4: Guns of the Patriots is set in a world where private military contractors do all the fighting around the world, and there are people who work for them who may be considered to have superpowers). So, like with DEMON, HUNTED, I’m going to try to have original elements in ZERO-SUM HERO, but not bend over backwards to do so. So, jumping around . . .
Aside from blogging, my writing-time will be divided among my three series/projects, with priority going to REMNANT OF US once my betas get back to me. From what I’ve done so far, and from what I’ve heard from other writers, having multiple projects allows you to stay active and enthusiastic. When you feel a bit tired of working on one project, it’s likely that you won’t feel the same lack of enthusiasm for another. Having other things to work on also will helps when waiting for beta reader feedback and agent responses. Wish me luck—and good luck to all the other writers out there. 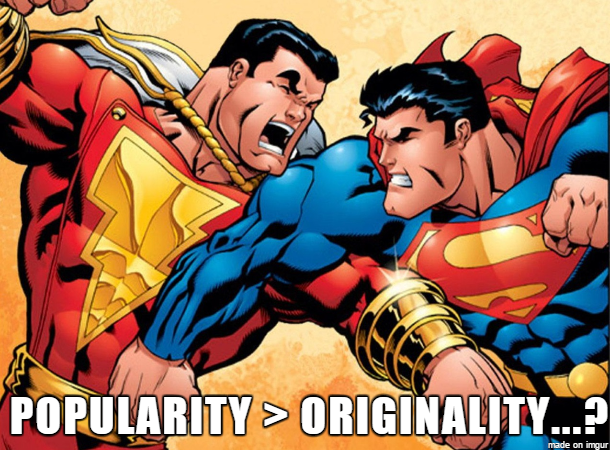 Despite being based off of the iconic Superman, Captain Marvel outsold Superman for much of the Golden Age of Comic Books before a copyright lawsuit pushed the owner to cease production of Captain Marvel (the lawsuit would likely be considered to be groundless today). Ironically, DC Comics later bought the rights to the original Captain Marvel character and now he exists alongside Superman in the DC comic book multiverse (though he’s referred to as Shazam ’cause Marvel Comics snatched up the trademark rights to “Captain Marvel”). Of course, I’d personally prefer as much originality as possible, so long as it doesn’t feel contrived (i.e, weird and abnormal for the sake of being weird and abnormal). This entry was posted in Novels, Writing and tagged A.D. Martin, Agent Query, Books, Demon Hunted, Novelist, Novels, Publishing, Remnant of Us, Science Fiction, Superhero Novel, Supernatural Novel, Writing, Zero-sum Hero. Bookmark the permalink. Both sound very interesting! From what I’ve read in the paranormal genre, I’ve never heard of a book being directly about a demon actively seeking forgiveness. If you ever publish, let me know! I love to read and review. I’ll try to remember, but it’s going to be quite a while before I finish that project. Haha. Best of luck to you! I really wanted to volunteer to beta read for you, but just couldn’t trust myself to have well thought out comments back to you in 14 days. The book does sound intriguing. After friends and family, I’d suggest looking at people you meet through your writing network (through blogs, Twitter, writer’s groups and writer’s conferences). You and I are opposites – I have actively avoided Supernatural as I write about angels/gods, because I don’t want it to influence me. I do see your point – it’s good to see what others have done so you can actively avoid copying them but…I’m such a strong believer that we should trust our raw creativity and I don’t want my interpretations of lore characters to be influenced by what others have done. Especially if others have done them brilliantly or famously, because then I won’t be able to “unsee” it. Lucifer is probably the hardest person I’ve had to write because it’s SO hard to find a path with him that isn’t cliché by now. It’s much easier to make these characters my “own” when fifteen prior incarnations haven’t already been planted in my mind. Also, Metal Gear Solid, whoo \o/ I picked up the legacy collection this weekend, having never played any of them. We’re working our way up from 1 thru 4, then throwing Peace Walker in there at some point. I’m really loving them so far. Good luck with your projects! I don’t think I’ve seen anyone work as hard as you. You deserve every penny of that future publishing contract. These stories’ concepts and what you reveal of them seem really interesting and I’d really like to see what you’re going to do with them! I would offer my help as a beta reader for your main story but unfortunately I wouldn’t be of much use except for pointing out a few mistakes here and there. I would really like to read it if it’s available some day, it really seems interesting! Cheers and good luck on the new draft! I’m in the agent-querying phase myself, so I know how long the process can be and how tempting indie publishing is as a result. At least we now have that choice. Publishing has changed so much, and it continues to do so daily. Good luck! You had me at demon protagonist, man. Good luck! I’m also juggling a romance fantasy and a humor book, so, yay! Sounds like some great projects! I love Supernatural and I never say no to a good superhero story! I have to be working on at least two WIP or I get frustrated or bored. I also have to read a lot while writing. The reading pushes me to write more. For a long time in multiplayer gaming I went by the nom de guerre of Abdiel. So I would be all over a book about angels having second thoughts!